ecosophia | Do You Fear What I Fear? "Do you flee what I flee? Do you flee what I flee? With an octopus for a head." They will wake the Old Ones from sleep." I will plunge this world into night!" Note 1: For best effect, this should be sung in one of those very oleaginous male crooner voices, with a backup chorus and a mildly overwrought orchestra. The results are far more eldritch and hideous than anything you'd hear in R'lyeh or lost Carcosa. Note 2; Yes, I know the H.P. Lovecraft Historical Society has a different version, which they've put into their excellent bundles of Cthulhoid solstice carols. I came up with my version before I encountered theirs, and with all due respect, I think mine is better. Just sang this to myself and it is solid gold. I'll be sharing this with my Cthulhu-loving friends! Christmas time, are you buying? To the stores are you flying? Shopping in a credit wonderland! As all our stocks go down and down and down. Can't afford what you desire. Shopping in this Christmas credit land. 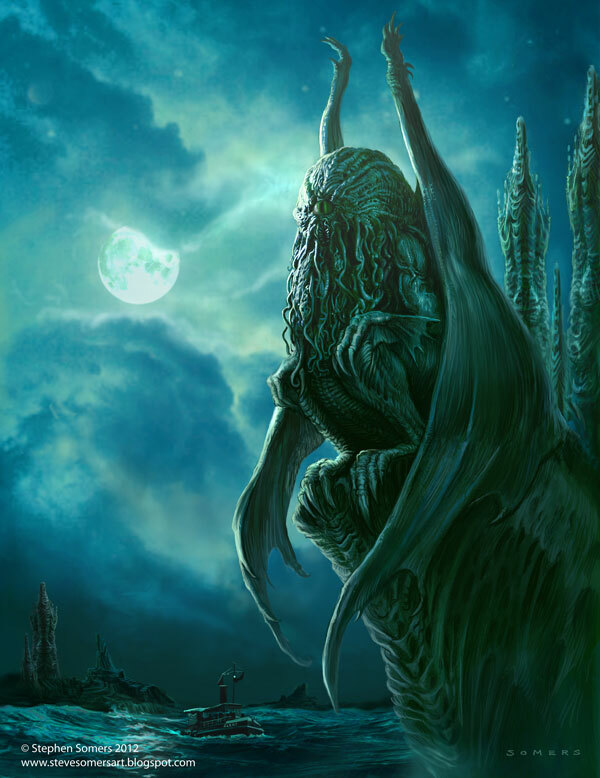 Do you happen to have a copy of the HP Lovecraft Historical Society's Solstice Carols? They did a whole album on the concept. Yes, and in fact I noted that in one of the two notes at the bottom. Some of their carols are great -- I'm a particular fan of "I'm Dreaming of a Dead City" -- but as I commented, I like my version of "Do You Fear What I Fear?" better than theirs. I won’t say you’re giving the Grouch of Hamburg a run for his money, but it’s a start! I love and sympathize with his bitter essay about the mindless cracking of whips and other annoying & unnecessary noises. P.S. - Please disregard the prior attempted version of this post with its ungrammatical omission of a word. Did I say Hamburg? Augh! I meant Frankfurt. I have a friend in Hamburg and he’s extremely kind, not grouchy at all! Ah... your last few posts here brought a much needed smile to my face. Thank you! Fantastic lyrics. So great, like it's supposed to be JUST like that.